Harley-Davidson Motor Company has launched a new Facebook application that aims to crowdsource advertising ideas directly from Harley-Davidson's nearly three million Facebook fans. 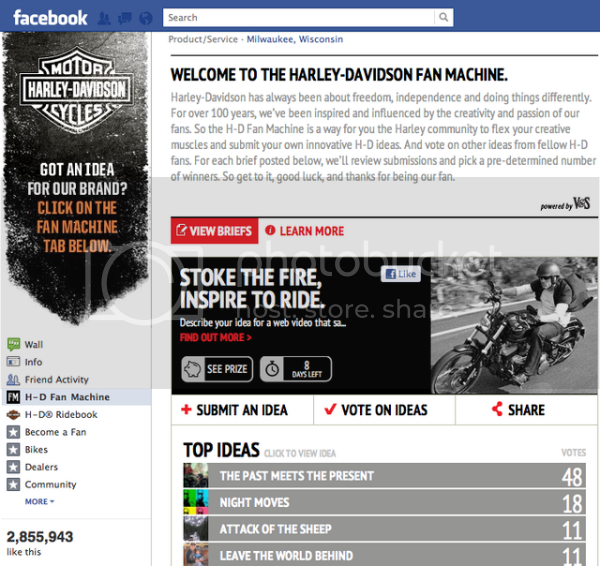 Called Fan Machine, it allows Harley-Davidson's Facebook community to review an advertising brief, submit ideas and vote on ideas from other community members. After selecting and rewarding the winners, Harley-Davidson will work with existing marketing partners to bring the best creative ideas to life. This is the first time the brand has combined the idea of crowdsourcing with the reach of its Facebook community. Harley-Davidson says it is in the midst of transforming its business to be customer-led throughout the company, which includes marketing approaches such as the pioneering use of crowdsourcing. "This is not a publicity stunt, or a limited time engagement. We're committed to crowdsourcing, because these ideas naturally flow from our passionate fans," said Mark-Hans Richer, Harley-Davidson's Chief Marketing Officer. "As the true stewards of our brand, our fans now have a huge new platform to share their ideas. "It works for us because their passion for our brand is second-to-none. They're going to light this thing up, and it will be fun to watch. Facebook also proves this passion is passing along to the next generation, where 40 percent of our fans are between the ages of 18 and 34." Harley-Davidson's first foray into crowdsourced marketing resulted in 'No Cages,' the Motor Company's ad campaign that debuted in February. "Getting a brand's fans and followers involved in co-creating advertising ideas is the future of marketing," said John Winsor, CEO of Victors & Spoils, the agency that produced 'No Cages.' "We're excited to work with Harley-Davidson as our first brand partner using the Fan Machine technology, a logical choice because of our deep partnership and their passionate fans." The first Fan Machine brief, which will focus on building on the 'No Cages' campaign, is available on the Harley-Davidson Facebook page -- www.facebook.com/harley-davidson.